Everdisplay developed a 6" 4K AMOLED display - achieving 734 PPI. 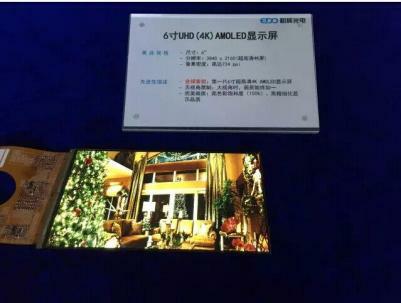 This is the first 4K 6" AMOLED prototype to be demonstrated. Everdisplay says that emerging applications such as virtual reality will demand such high-resolution displays. Everdisplay started mass producing 5" 720p AMOLED displays towards the end of 2014. The company is also developing 5.5" and 6" panels for mobile devices, a 1.4" 400x400 circular AMOLED for the wearable market and an 8" AMOLED for the automobile market. The world's highest density display in production is Sharp's 5.5" 4K IGZO LCD display (2160x3840) - that achieves 806 PPI. The highest density AMOLED in production is SDC's 5.1" QHD (577 PPI) Super AMOLED. In November 2014, Japan's SEL demonstrated a 2.8" 2560x1440 panel - that reaches a PPI of 1058! This is just a prototype panel at this stage, and is based on SEL's CAAS-OS (C-Axis Aligned Crystalline Oxide Semiconductor) backplane, and a WRGB structure. Last month Samsung Display launched a new project to develop the world's first 11K mobile display, that will achieve 2250 PPI(!). The Korean government will support this five-year project with a $26.5 million grant. Samsung explains that this "super dimension" display will enable an "optical illusion" that will enable 3D images. If EDO has been making 6000,000 5" AMOLED panels a month since Nov 2014,what are they doing with them ? What products are using them? I do not know exactly, but back in Nov 2014 the company said they already achieved a design win with a Chinese mobile phone maker. Gosh you sound like a real expert. The first round of consumer VR devices will surely fail because you've said so. Any info how they achieved such a high pixel density? It's my understanding that shadow masking can't pattern features small enough for this ppi. It's extremely hard to achieve wide FOV using a microdisplay. A few years ago it was basically impossible, but thanks to some technological advancements there are some new ways to get it wider, but still not as wide as in Oculus/Vive yet. Slightly lackluster means failing? What comment have you been reading Bob? Yes, OLED microdisplays achieve a super high density... but it is not really fair to compare them to mobile-phone sized displays, the technology and applications are quite different.